Using manufacturer's records and the memories of those who built them and worked on them, this book tells the story of the steam and diesel locomotives produced by this famous Queensland company. Narrow gauge locomotive manufacture began after the Second World War. 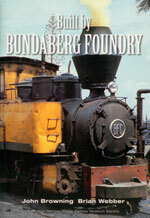 Bundaberg Fowler steam locomotives were used to haul sugar cane, and Bundaberg Jenbach diesel locomotives were supplied to the sugar and coal mining industries. 35 years later, the Hunslet Engine Company assisted the Foundry to produce new powerful canefield diesels. Subsequently, many ex-government railway locomotives were converted for cane haulage. Many of the steam locomotives are well known because of their use on Australian tourist and heritage railways. The 80-page A4 book is printed on high quality art paper and contains more than 160 photographs, most of them in colour, as well as a number of drawings and diagrams.